This guide is meant to provide specific reference information about the Indigo Object Model (IOM) as used by scripters writing embedded scripts as well as developers writing Server plugins. Scripters can be Developers and vice versa - we just wanted to define the different potential uses for IOM. The IOM is divided up based on the major object types: Devices, Triggers, Schedules (not yet implemented), Action Groups (not yet fully implemented), Variables, and Folders. There is also a utility base class (and subclasses), Action (not yet complete), that's used with the major object types that support actions. You should be able to tell from the context if it's Python code or, sometimes, AppleScript (which will be deprecated in Indigo 7.2 and later), if we're comparing how to do something. Some conventions of the Python API: all values are represented in camelCase, where words aren’t separated but each starts with an uppercase letter. The first character of all class names are uppercase (DimmerDevice) and the first character of class properties are lowercase letter (folderId). Constant enumerations start with a lowercase “k” (kEnumerationName), and each enumerated value begins with an uppercase letter (kEnumerationName.EnumeratedValue). A note about version numbers: As we've revised the API and added features, we've incremented the API version number. Up until Indigo 5 v5.1.1, the API remained 1.0 and the documents were just updated with new features (which could lead to incompatible features if using an older release of Indigo). As of Indigo 5 v 5.1.2, we've begun incrementing the API minor version number (1.X) whenever we add new features. The major number (X.0) will only be incremented when we do something that will break backwards compatibility or when there are major changes. See the API version chart to see which API versions were released in which Indigo version. NOTE: Indigo uses Python v2.7. Different versions of macOS might have newer versions of python installed, so make sure that you're using Python 2.7 for your development or you could get a nasty surprise when you turn your code into a plugin (if you're developing code outside of the plugin architecture). If you execute “python2.7” at the command line instead of “python” you'll get the installed 2.7 version. Action Group An action (or collection of actions) that can be used by multiple Schedules, Triggers, and Action Groups. This allows you to change the collection in a single place rather than editing multiple Schedules, Triggers, etc., that require identical actions to be executed. Developer A person who writes Server Plugins. Direct Parameter The first parameter to a command, although it may be optional. Any further parameters to a command must have a name specified. Event Some external plugin defined event (outside Indigo) that is used to instruct the IndigoServer to execute a Trigger. Protocol Any built-in home automation technology that Indigo supports (INSTEON, X10, etc.). This does not include plugins that might implement their own protocol. Schedule An action (or collection of actions) that will be executed based on some temporal settings - dates and times. When the appropriate time and date is met, IndigoServer evaluates any conditions specified in the schedule in order to decide if the actions associated with the event should execute. In previous versions of Indigo, these were referred to as Time/Date Actions. Script Any section of code using the IOM regardless of language being used. Scripter A person who writes embedded scripts. Trigger An action (or collection of actions) that will executed based on some input event - a device state change, an event from a plugin, an email received, etc. When the event occurs, IndigoServer evaluates any conditions specified in the trigger in order to decide if the actions associated with the event should execute. The Indigo Object Model (IOM) is a collection of objects and methods that allow scripts to interact with objects in Indigo. From an architectural perspective, the most fundamental design point that needs to be understood is that the host process that executes python scripts is a separate process from the IndigoServer process - which is where the objects actually reside. We do this so that a single script or plugin can't bring down the entire IndigoServer. To update a copy of an object that you previously obtained, call the object's myObject.refreshFromServer() method. A couple of notes to help you understand these rules. First, the IOM allows Server Plugins to attach arbitrary attributes to any object. We call these plugin properties, or just props. They are read-write for a Server Plugin, but are readonly for all Python scripts. 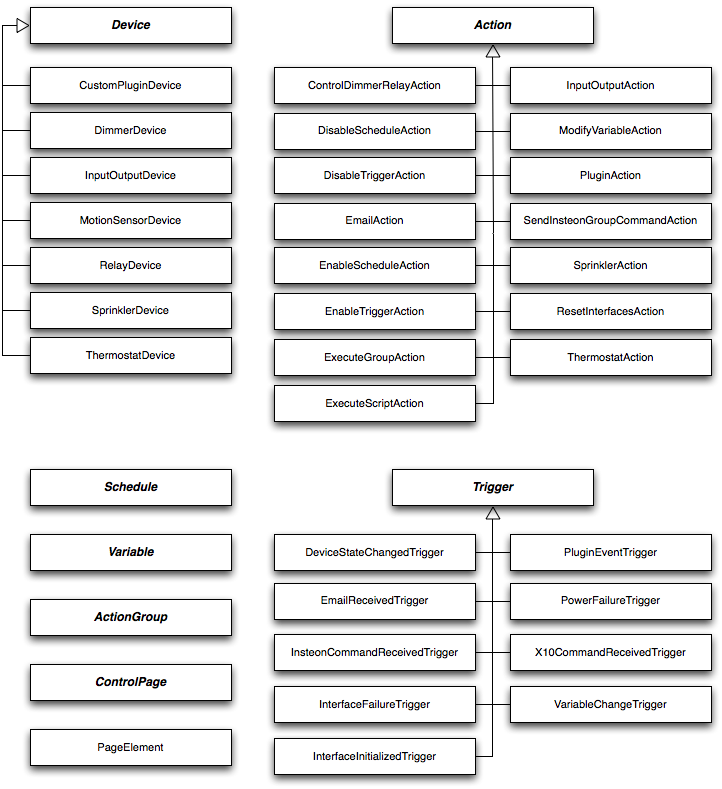 Second, as discussed in the Plugin Developer's Guide, a Server Plugin may define multiple device types. All devices have some state (or states): on/off, paused/playing/stopped, heating/cooling/off, etc. These states are used in Triggers and shown on Control Pages. Your Server Plugin will need to be able to tell the server whenever a state changes for one of it's devices. That's what the last rule above is referring to. See the Devices description for more information and examples. The next question you probably have is “How do I create a new object in the IndigoServer?”. The simple answer is that most class namespaces have a create() method. They work a bit differently based on the class type (for instance, indigo.device.create() is used as a factory method to create all types of devices), but it's always named the same. There are also duplicate() and delete() methods for each. See the individual class pages for details. This will keep the IOM simple and understandable and it avoids significant complexity. In this section we’ll describe the classes exposed to your script so that you can use them for whatever your script needs: checking the value of a variable, the state of a device, the definition of an event or action, etc. There are a few classes that are special. One is Action and it’s subclasses (collectively referred to as “actions”). Why are these classes different? Because outside of the trigger, schedule, action group, or control page that they’re associated with they aren’t individually addressable in the IndigoServer: for instance, there is no way to identify an action without first identifying the trigger that it’s associated with. So, how do you interact with actions? Directly, as you would any other object. You can create one (which creates it locally), edit it, etc. Once you have the object set up correctly, you can add it to the appropriate local copy of an object then call the object's replaceOnServer() method. If you have a local copy of an object and you want to ensure that it's in sync with what's on the server then call the object's refreshFromServer() method. Don’t worry if this seems abstract: the examples section for each class page has examples of how to manipulate actions. Another very important concept that we’re introducing along with the IOM is the concept of an identifier, or id. Every top-level object in Indigo (action group, device, folder, schedule, trigger, variable) now has a globally unique integer ID associated with it. All commands in the IOM accept the id of an object or the object reference itself (along with the name). You should never store the object’s name. The id is visible in the various lists throughout the UI. You can also select any object in the GUI and right click it to get it’s contextual menu where you'll find a Copy ID (123) item that shows the ID and allows you to copy it to the clipboard. Server plugins that define config UIs that use the built-in lists will get the id(s) of the object(s) selected in the lists rather than the name. Now, if you're being very observant, you'll notice something missing: Control Pages. It is our intention to support Control Pages in the IOM, but unfortunately it just didn't make it into v1. Look for it in an upcoming IOM revision. If you are a user of the Indigo AppleScript Dictionary (AppleScript support will be deprecated in Indigo 7.2 and later), you may have certain expectations set about how you would use the IOM in Python. While there are similarities, there are also some non-trivial differences. Most of these will become apparent in the following sections, but we’d like to outline a few here. First, and most obvious, is the nature of most objects in the IOM as we discussed earlier - using copies and updating the server when you change the properties. In AppleScript, when you alter an object’s property the change is instantaneous since the script is running in the IndigoServer process. That significant architectural difference is what led us to the split between objects and the commands that work on them. The next difference that you’ll notice is that there are many more classes in the IOM than there are in AppleScript. That’s because in AppleScript the classes are very flat: a device contains all possible properties for all devices. The same applies to the action step (Action in the IOM) class: in AppleScript it contains all possible properties for every action type. In the IOM, we broke these out into an object hierarchy in which a base class is defined that contains the common properties, then subclasses add the specifics for each type. Check out the figure in the next section for a graphical depiction of the object hierarchies in the IOM. This will come as no surprise to anyone that’s used a C-based language. However, if you’re coming from AppleScript you’ll need to keep this in mind. Indigo exposes a couple of special classes in Python: indigo.Dict() and indigo.List(). These are very similar to their Python counterparts (dict and list). The big difference is that when you're dealing with dictionaries and lists that come from the IndigoServer and that go to the IndigoServer, you'll want to use these rather than the built-in Python types because they are handled natively by Indigo and can automatically be saved to the database and preference files. must contain values that are of types: bool, float, int, string, list or dict. Any list/dict containers must recursively contain only compatible values. do not support value access via slicing (we might add this eventually). always retrieve values (ex: myprops[“key”] or mylist) as a copy and not reference of the object. keys can only contain letters, numbers, and other ASCII characters. keys cannot start with a number or punctuation character. keys cannot start with the letters XML, xml, or Xml. a['a'] = "the letter a"
print(str(a))			# no change from previous output! If you just need to override an existing value in a container (and not append to it), then a more efficient solution is to use our helper method setitem_in_item. It avoids creating temporary copies of values. To change a device, in most cases you get a copy of the device, make the necessary changes, then replaceOnServer(). You'll find specific information about each of those in the appropriate section linked below in the Classes and Commands section. Each of the objects above corresponds to one of the high-level objects in Indigo. In the UI, you know that you can create folders for each of those object types. To access the folders available for each type, you can reference the “folders” attribute: i.e. indigo.devices.folders. This is also a read-only indigo.Dict of folder objects. As with the other top-level classes, you manipulate folders within specific namespaces, described on the folder class page. Finally, these objects define some convenience methods as well as supporting most of the standard Python dict object methods. The first added method, getName(elemId), is a shortcut to get the string name of the item. Normally you would need to get a copy of the object (which would pull the entire object from the IndigoServer) then get the name, but this method is more efficient since it only gets the name from the IndigoServer rather than the whole object. So, an easy way to get a variable folder's name (maybe for logging) would be to do this: indigo.variables.folders.getname(1234). Make sure you use the correct object (indigo.variables) so that we'll know where to search for the folder. The other additional method is subscribeToChanges(). This method doesn't return anything - rather, it tells the IndigoServer that your plugin wants notification of all changes to the specific object type. Use this method sparingly as it causes a significant amount of traffic between IndigoServer and your plugin. What kind of plugins would use this? One good example is a logging plugin - one that's logging activity within Indigo (like our SQL Logger). Another example is a plugin that's doing some kind of scene management - you would probably want to issue a indigo.devices.subscribeToChanges() at plugin start so that you'll always be notified when any device changes - you can then determine if your scene “state” has changed and act accordingly. Note that subscribeToChanges() only reports actual changes to devices - so for instance when a light turns ON you'll get a notification. If the light is commanded to turn ON again, you won't get the notification because the device state didn't change. Use the lower-level subscribeToIncoming() and subscribeToOutgoing() methods in the indigo.insteon and indigo.x10 command spaces to see commands regardless of their effect on device state. A note on iteration: when the above loop begins, the list of devices is fixed. So if mid-loop an element is added then it will NOT be iterated (unless the entire loop runs again later). Likewise, if an element is deleted midway through, then the iterator gracefully handles it and just ignores that deleted item (it skips to the next item automatically). So if items are added/removed during an iteration it never throws an exception – it handles it gracefully but you are not guaranteed to get the new ones. Unlike devices, however, you may only use a single trigger filter - anything else will result in an empty list. Other exceptions, such as IOError, MemoryError, OverflowError, etc., are also possible although less likely to occur. So, from a discovery perspective, the dir(obj) method will list all properties and methods for an object. The hasattr(obj, attr) will test an object to see if it has a specific attribute. The obj.__class__ attribute will show you what class the object is. As you explore IOM objects, these methods will help you figure out how to use IOM objects effectively.